If there’s one goal of interior design, it’s to make the most out of your interiors. Sometimes, the space you’re working with is ideally set up and all it takes is a few small tweaks. Other times, you need to consciously work toward changing the entire perception of the room. On these occasions, it’s all about harnessing the power of interior design optical illusions to create change. If you’re not aware of how much of an impact these design maneuvers can make, you’re in luck. Below we’ve outlined four of the most common illusions, as well as how to you can pull them off in your own home. Keep reading for a crash course on every decorator’s secret weapon. First up, we have color. 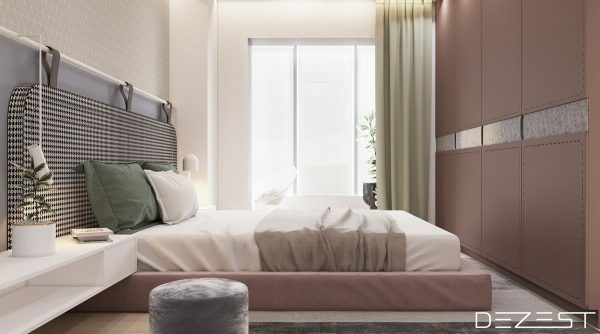 While it’s probably not hard to believe that the color you choose will drastically affect the overall feel of a room, knowing how to use it to your advantage is a different story. Lighter colors, for example, make a room feel bigger. 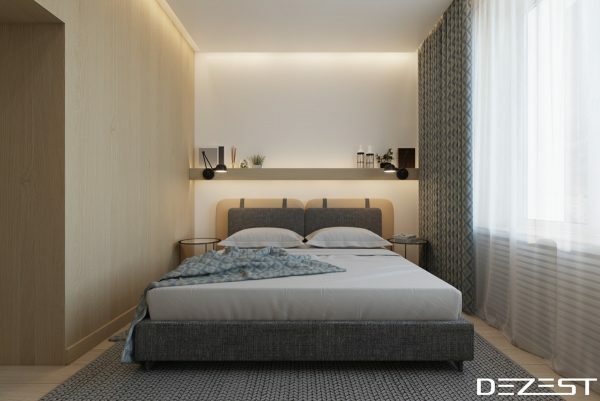 Consider using whites or lighter neutral shades in areas such as tight bedrooms or cramped living spaces. Be careful in larger rooms though. 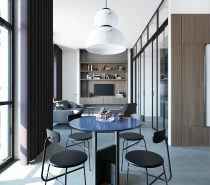 Sometimes, though these subdued shades can feel like the perfect fit for those with a modern aesthetic, it can make sizeable spaces — like great rooms or open concept areas — feel stark. Darker shades, on the other hand, can cause rooms to feel like the walls have closed in a little. For this reason, we don’t recommend using them in tight areas. However, occasionally, a little closeness can work to your advantage. Consider adding a pop of rich color to your dining area or another space where the goal is to facilitate conversation. We’ve talked about scale and proportion before, but this time we’re going to focus on furniture. The reality is, the furniture you place in a room plays an unspeakably big role in how the finished product looks. The key is making sure yours is sending the right message. Those with less square footage to contend with should consider smaller, thinner furniture and, in particular, pieces with defined legs. This added visual of empty space will help open up the room by giving the illusion that the furniture is taking up less space. If, however, comfort is your goal and you have the room to spare, go ahead and choose grounded furniture instead. These pieces are heavier and really drive home the feeling that this space is a place where people can feel free to make themselves at home. Sometimes homeowners — particularly those with older homes — need to contend with uncomfortably low ceilings. 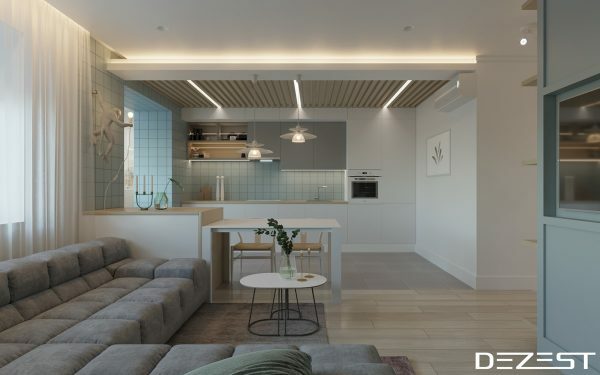 Spectacularly pitched ceilings may be a newer real estate trend, but that doesn’t mean you have to live with feeling as though you’re stuck in a cave. This time, the answer lies in your lighting. When you choose lighting for your home, the bulbs are typically directed to either throw light up toward the ceiling or down toward the floor. Subconsciously, it will also draw our eyes in that direction, as well. 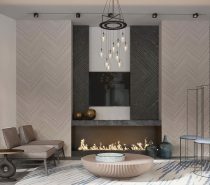 With that in mind, if you want to create the illusion of having higher ceilings, consider incorporating sconces or another type of uplighting. That said, downlighting, which is typical for table lamps, desk lamps and floor lamps, is not necessarily a bad thing. They’re often ideal for lighting particular features of the room and work excellently for drawing the eye where needed. 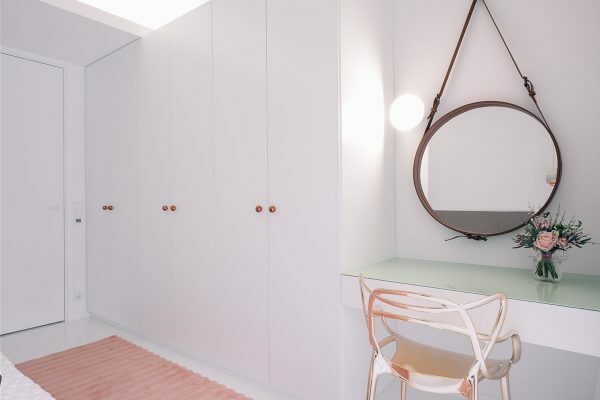 When talking about interior design optical illusions, there’s no way that we could bypass the cornerstone of interior design advice: If you need to fool the eye, add a mirror. Even today, this is good advice and it can impact your room in one of two ways. On the one hand, adding a mirror to a small room will make it look larger. In this case, you want to position the mirror on the back wall of the room, or the farthest point from the door. 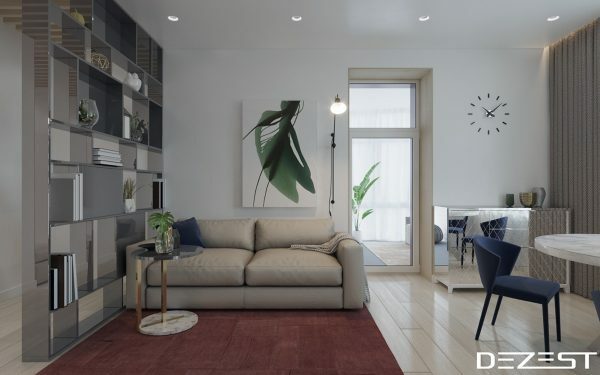 This will help draw viewers across the entirety of the space and trick them into taking in as much square footage as possible. Mirrors can also help add visual height to a room. 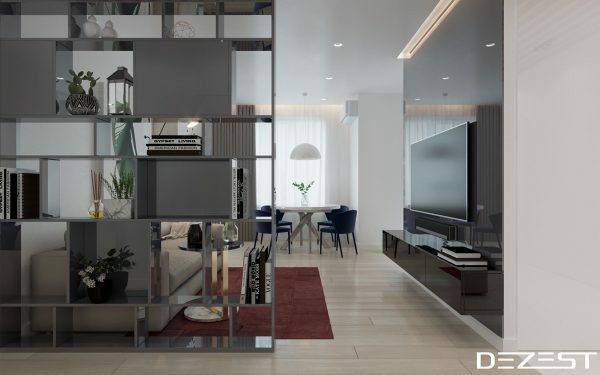 Here, choose a vertical mirror, so eyes follow that line of sight all the way up to the ceiling. Ideally, every space we design would be a large, open, blank canvas for us to tailor to our personal tastes. However, anyone with design experience can tell you that is rarely the case. Sometimes we need to use tricks to help viewers perceive a space as better than it actually is. Fortunately, we have interior design optical illusions to save the day. Use our tips whenever your interiors could benefit from a little sleight of hand. How do you feel about these interior design optical illusions? Can you think of any more to add to the list? Tell us in the comments. 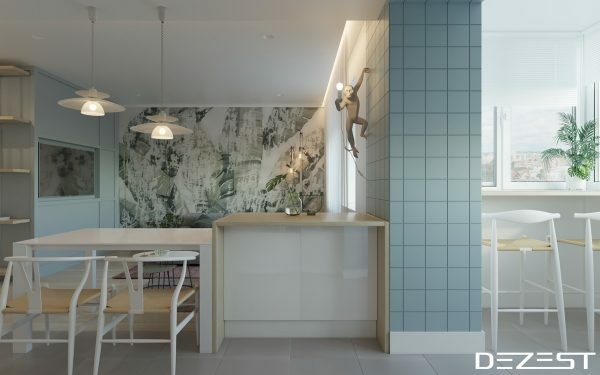 The post 4 Interior Design Optical Illusions That Change the Way You See Your Space appeared first on Freshome.com. 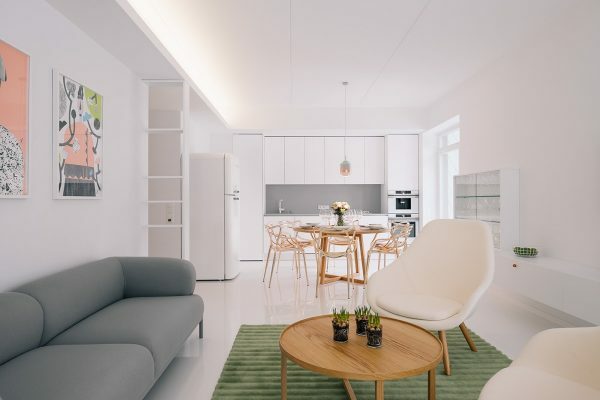 Coral and green are the fresh and friendly colours of choice in this compact modern apartment in Nõmme, Estonia, designed by Ace Of Space. Set against a pure crisp white backdrop, the more colourful home style elements are reminiscent of a summer garden. Muted grass green rugs and brighter leafy greens give the home a natural feel despite the somewhat limited appearance of natural textured materials and potted house plants. The cheerful coral hued pieces work beautifully alongside furnishings and accessories that are picked out in shining metallic gold and copper. The three harmonious tones meld warmly and lift the scheme by introducing joyously unexpected shining moments. The apartment walls and floor treatments are completely stark. 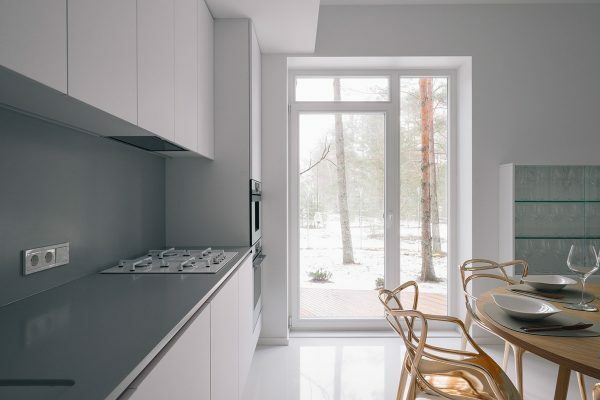 White paint covers each and every internal wall. 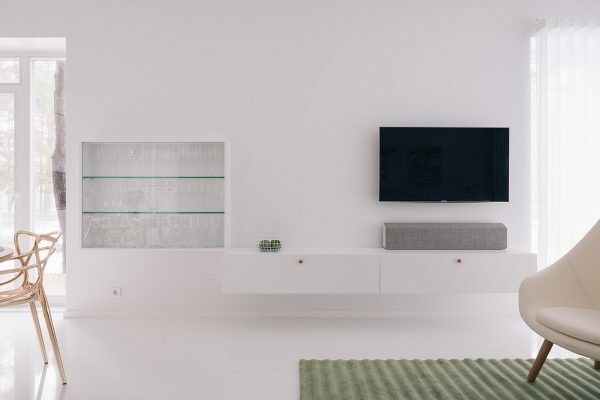 Bookcases and cabinets are coated in a white finish. 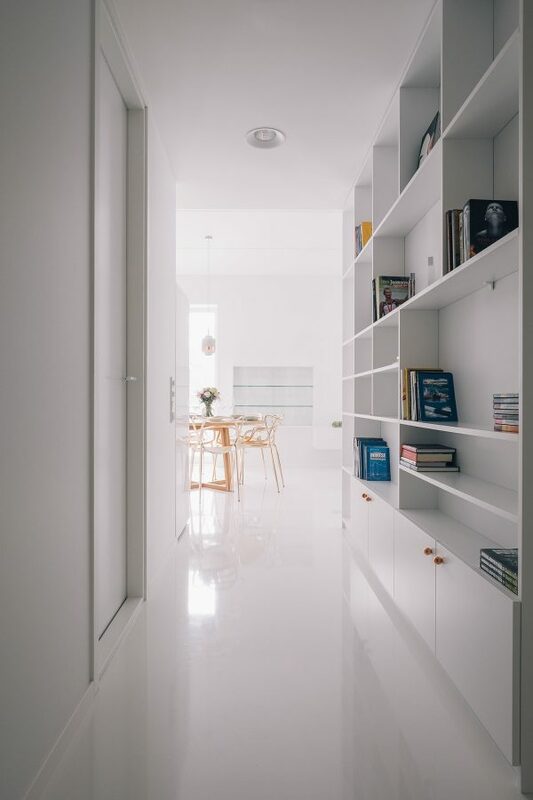 Floors are a clean light-reflecting gloss white. 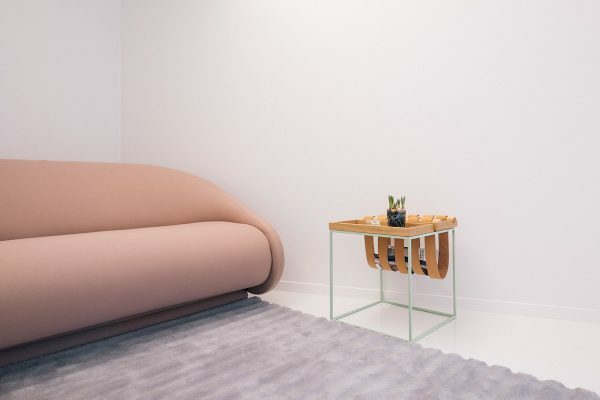 The largest pieces of furniture in the room are also free of colour, with the sofa upholstered in soft grey fabric and two comfortable chairs in contrasting ivory. 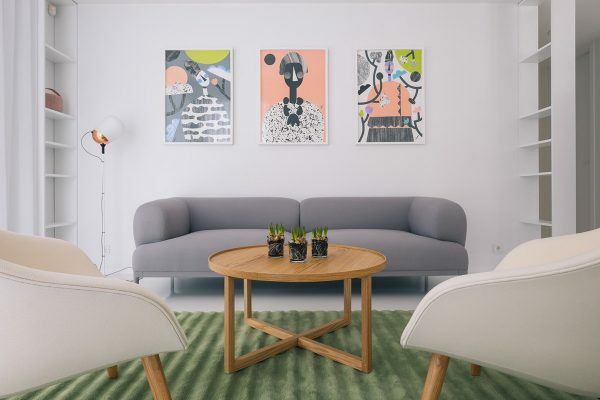 The first blast of colour hits us from the wall space above the sofa where a series of three pieces of artwork by Anu Samarüütel take pride of place. 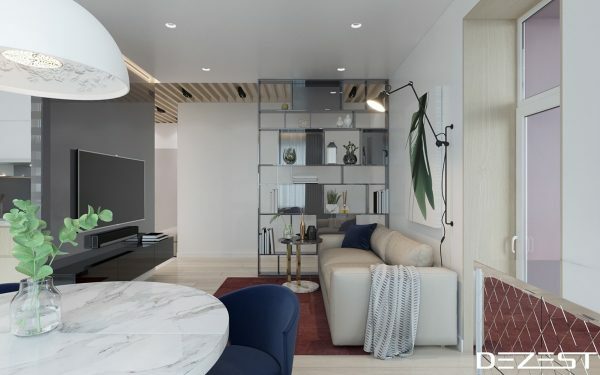 The small gallery sets the tone and palette for the entire apartment. 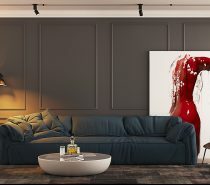 Beside the light grey modern sofa, a floor lamp is trimmed with copper, which matches beautifully with the coral tones in the trio of artwork. 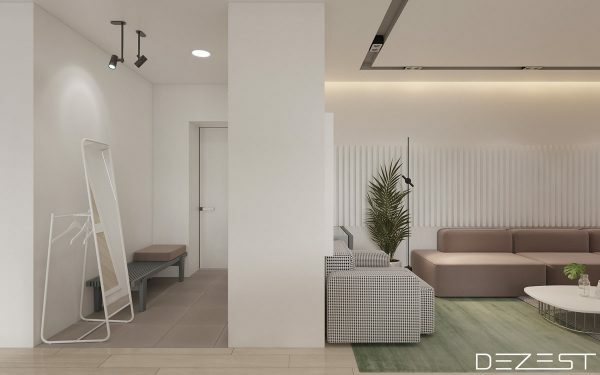 In front of the sofa, a wooden coffee table adds a little more visual warmth to the scheme, and the nugget of natural tone is picked up in the legs of the two contemporary armchairs. 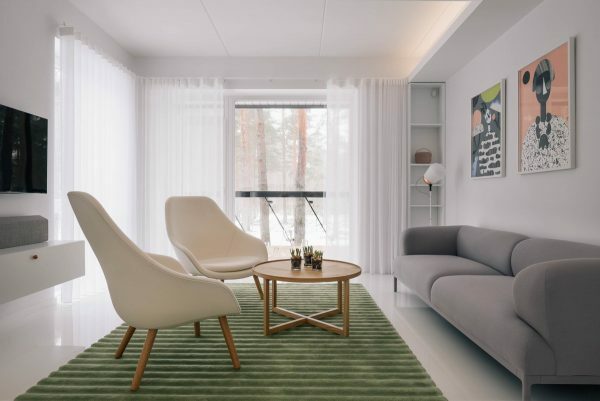 Opposite the seating area, a white wall mounted unit with copper handles runs beneath the flat screen television. 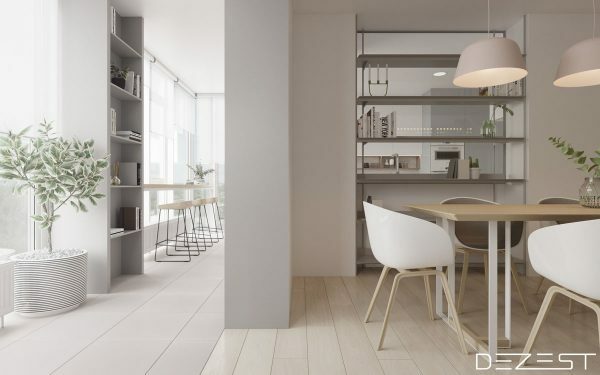 Due to the open plan nature of the home, the lounge merges into a dining area. Here a glass fronted cabinet holds a selection of wine glasses. 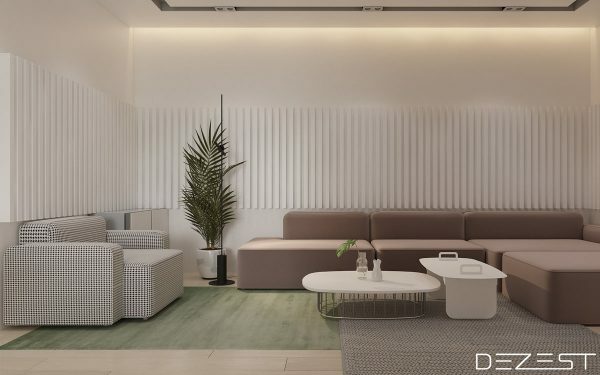 The lounge area is defined by a muted green rug, which also adds a touch of cosiness underfoot. Three tiny potted plants form a centrepiece on the round coffee table, and complement the hue of the area rug. 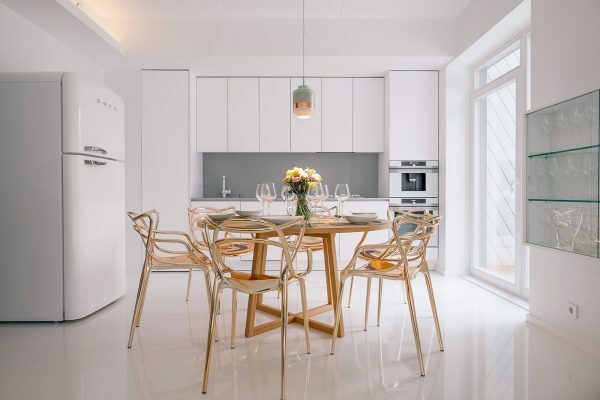 Over in front of a handle-free white kitchen, a set of golden dining chairs encircle a wooden dining table. 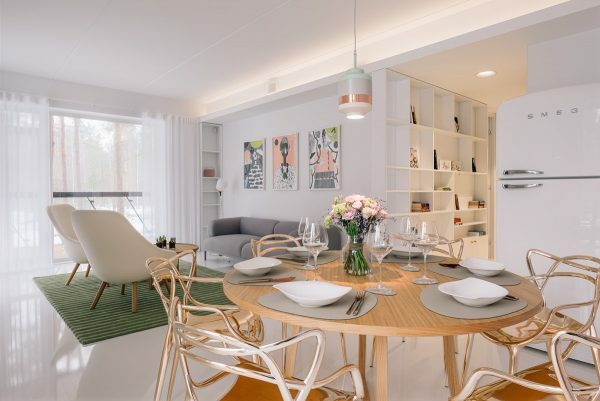 The six metallic modern dining chairs bring a high-end look to the small space, they are the Kartell Masters chairs. The table is set with grey placemats to tie the colour theme of the dining area with the sofa. A decorative vase in the centre holds a floral arrangement that is a purpose picked posy of coral and pale green. Above the table decorations and wine glasses, a petite dining pendant light has a metallic band that matches with the eye-catching dining chairs. 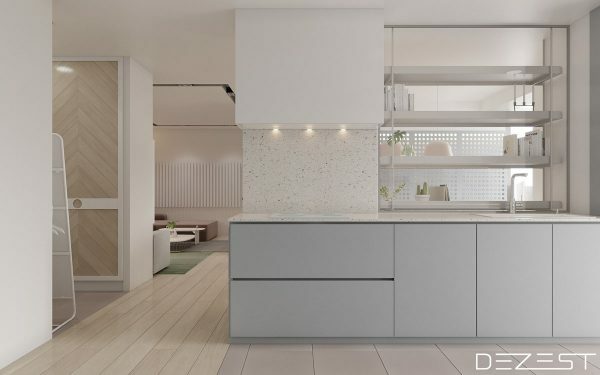 The white kitchen has a minimalistic style, with a countertop in smooth grey and a concealed extractor. The home entryway is lined with bookcases and cabinets with copper handles. 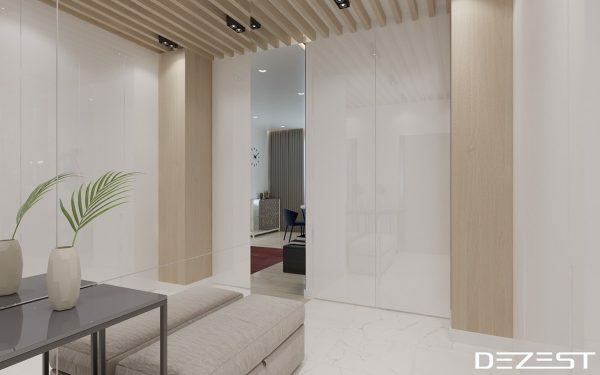 The white gloss floor treatment that covers the entire open plan living room is present here in the hallway too, and runs on seamlessly into a home office. In the study, a simple coral settee is the only splash of solid colour in the room. An understated wooden table by the window has been playfully paired with a bright golden desk chair. 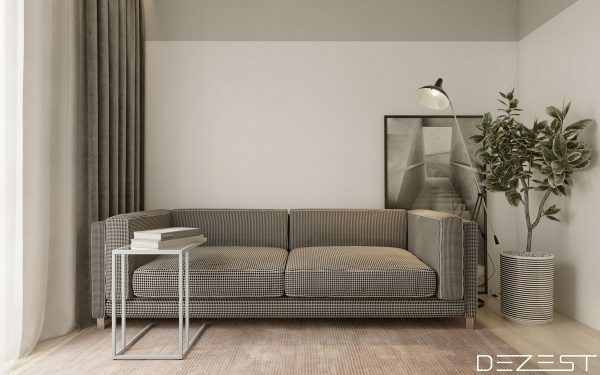 A sumptuous grey rug warms the floor by the sofa. A small end table has a neatly integrated magazine rack. 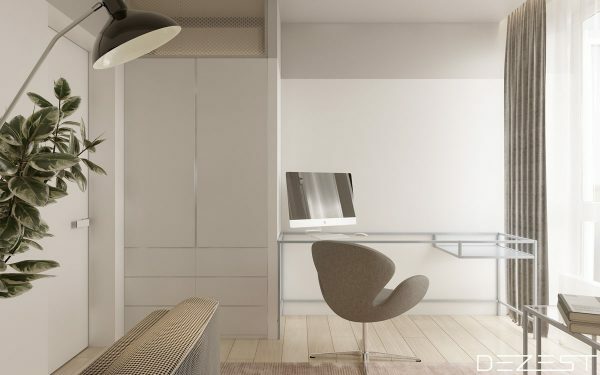 A smart grey dressing stool sits at one end of the white entry hall. 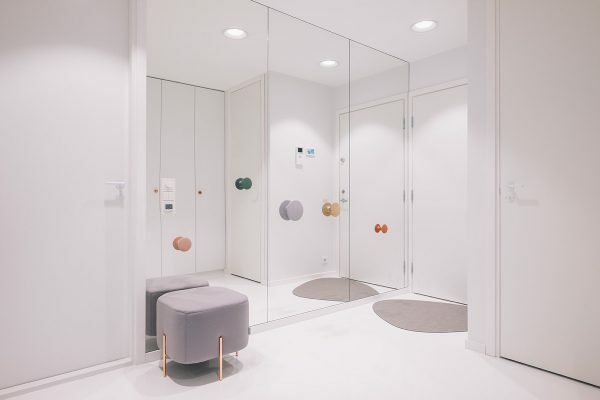 Quirky mismatched door knobs decorate mirrored closet doors. 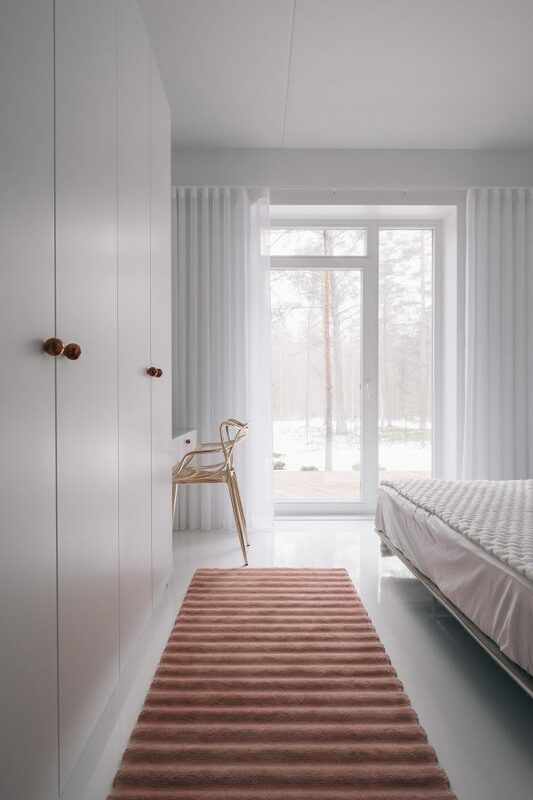 A coral runner rug leads us into the bedroom. A striped bedroom pendant light adds a little interest over a simple metal framed side table with a wood tray top. On the table is the Tumbler alarm clock by Menu. The built-in dressing table is elegantly topped with a sheet of glass, and a round mirror with a leather frame continues the look of understated glamour. 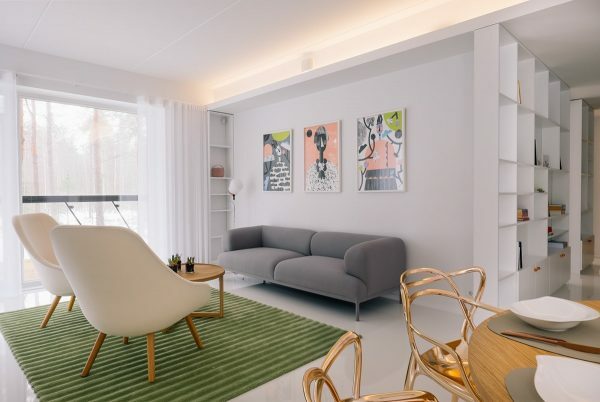 In the bedroom we find another use for one of the very versatile Kartell Masters chairs, formerly seen used as a dining chair and a desk chair in this apartment scheme. This time the golden design has been utilised as a dressing chair. It could even serve as a modern outdoor chair on a balcony, or in a courtyard or contemporary garden. 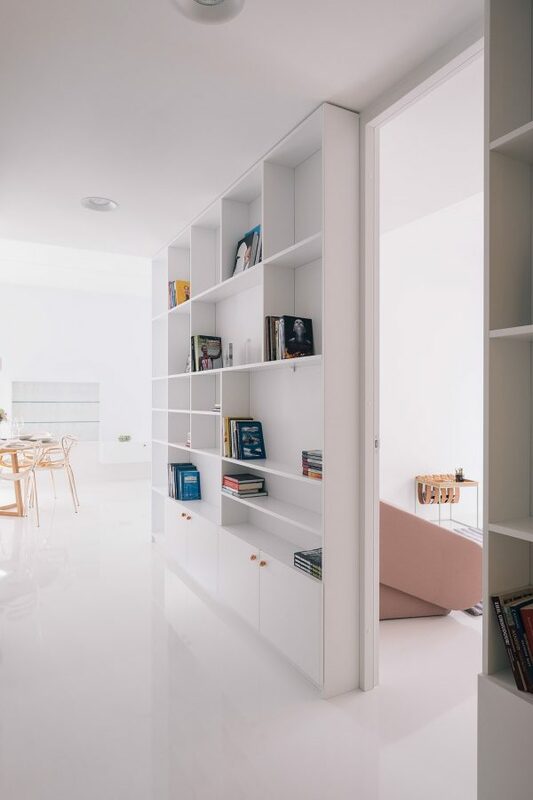 The storage in this home keeps everything tucked away neatly. 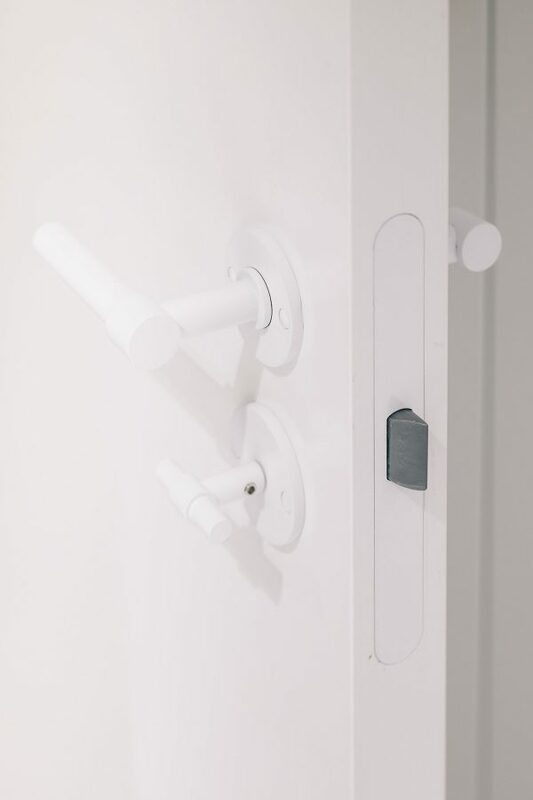 The door handles are white powder-coated to blend in with the white door finishes. 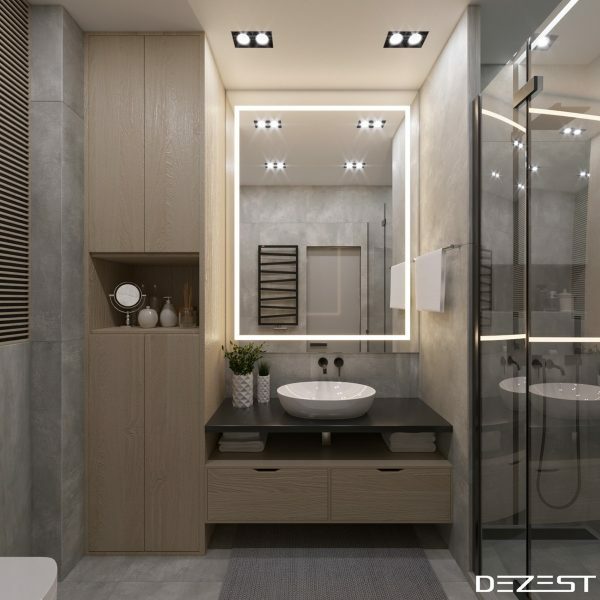 Inside the bathroom we find many of the same design elements that are implemented elsewhere in the home. A wall hung vanity unit matches the storage cabinets installed in the entry hall and in the lounge beneath the TV, complete with the same copper handles. A large round mirror over the vanity unit, with a brown leather strap frame, is identical to the one in the bedroom. Here the floor is white tile, and the unique faucet is pure white, much like the door handles. Another piece of artwork by Anu Samarüütel decorates the space above the WC. A coral coloured hand towel matches the hue in the painting, and the palette in the rest of the home. 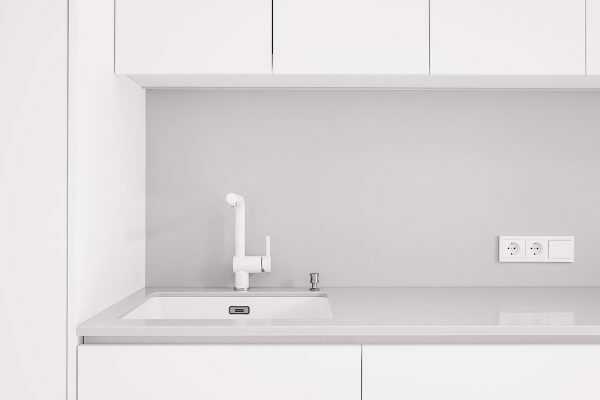 The faucet in the kitchen is also a pure white coated design. 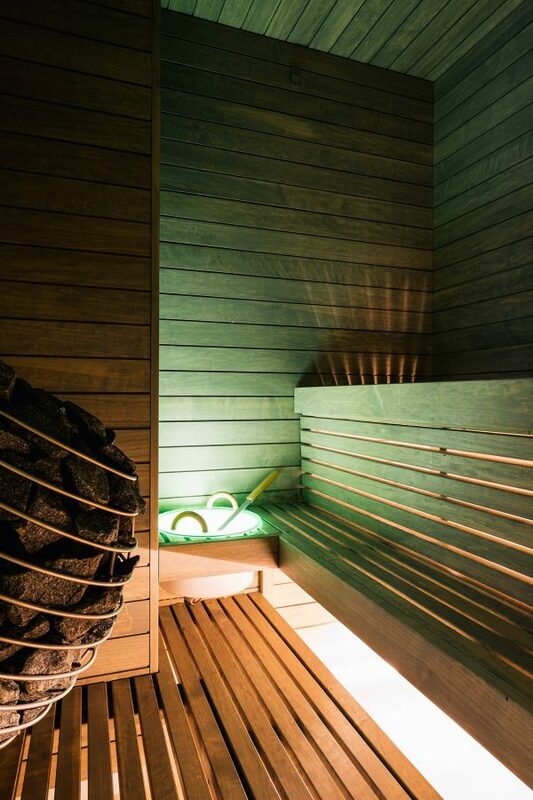 This cool home comes complete with a little hidden gem too, in the shape of its very own sauna. Traditionally, pastels evoke the colours of nurseries – baby pinks, blues and creamy lemon yellows that hush the children in your family. But pastels have another side. Full of light, soft and oh-so-sophisticated, pastel greys can turn the longest of curved walls into a dreamscape. The most delicate shades of mauve can colour block couches; the faintest of baby blues partition your space. Pastels can ever-so-subtly direct your eye to teal bathroom cabinets, or drench your kitchen splashback in light blue. 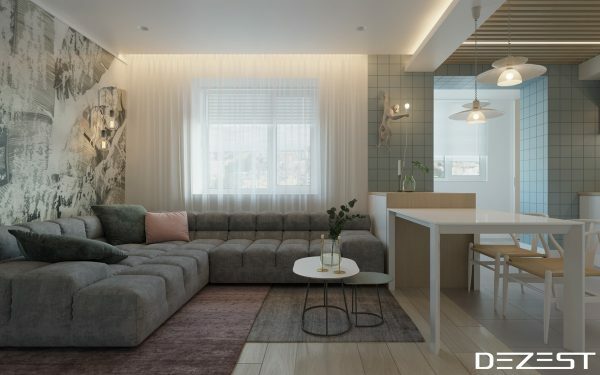 Whatever the size or scale of your apartment or interior, take a peek at these designs by visualizers Dezest for some pastel inspiration. 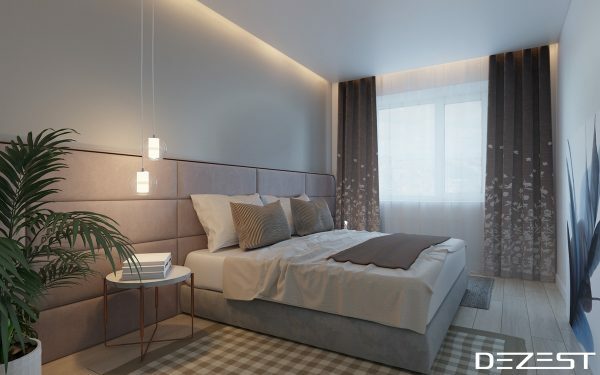 Sitting at a modest 105sqm, this apartment in Dnepr, Ukraine, uses shades of mauve and grey to create a dreamy yet elegant space. Welcoming us into the sitting room, two white modern coffee tables are surrounded by a mauve L-sofa and lightly-chequered one-seater. 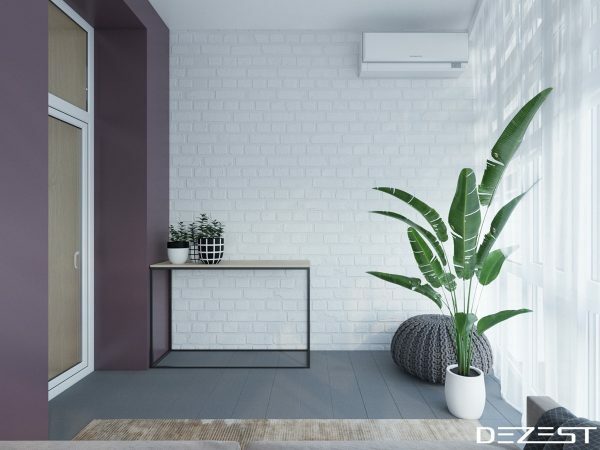 Wall heaters hidden in white and a tall sprig of a house plant add interest. 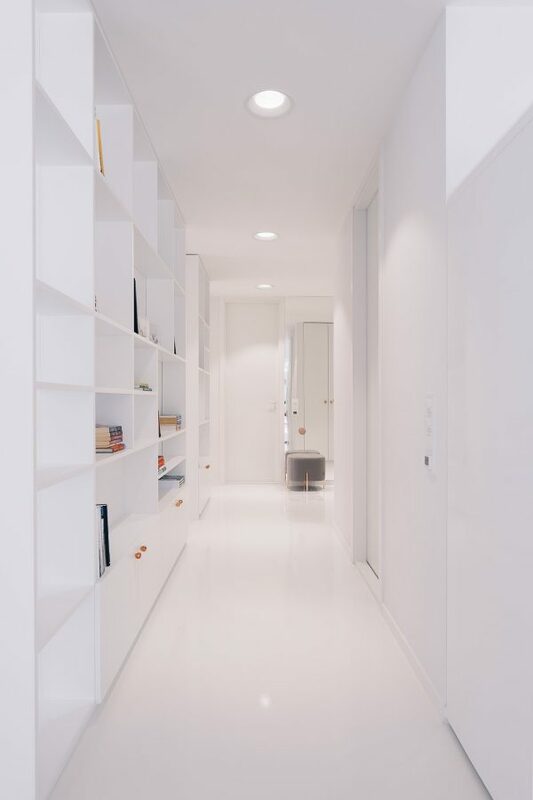 Separating from the lounge, a large white plinth creates a simple corridor. Camera lights peer down from the ceiling, while a Scandinavian standing mirror draws a white frame. A statement bench in teal provides a place for tired visitors. As the interior winds round to the dining table, a trio of dining room pendant lights, designed in the Muuto Ambit style, squiggle their wires towards the wooden flooring. Their soft shades of light mauve illuminate a small plant in silver and a host of white cubby chairs, each facing each other against punctured baby blue. On the other side of the dining table, six mid-grey shelves open up to the kitchen. Another round-potted tree suns itself by the window, while another stack of shelving holds more books, ornaments and pot plants. 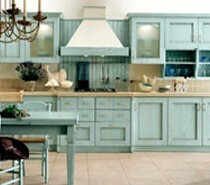 The kitchen shows itself in the same pastel blue, a shade so light it appears almost grey. As shared ornaments peek through the dining room’s shelving, a row of stencil-bottomed stools catch more rays. A matching light-wooden bench ties into the floor. 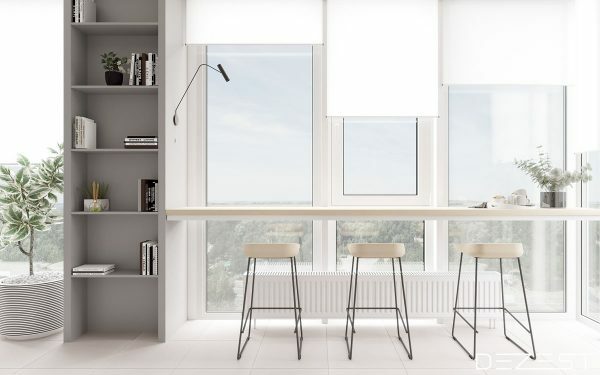 A seat on one of three wooden stools boasts a view of the city, partially obscured and displayed by oscillating window shades. A swing arm wall lamp keeps watch beside the fern opposing. Leaning to the left, another corridor opens up beside the kitchen counter. A small space for preparation with speckled splashback is lit by three bulbs. 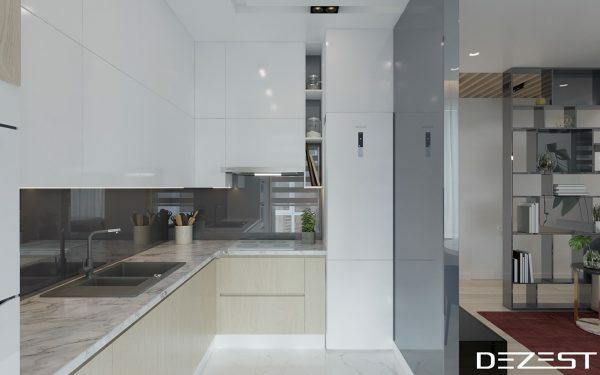 A 180 degree-turn reveals more room for spices, more room for preparation, and a few kitchen appliances. 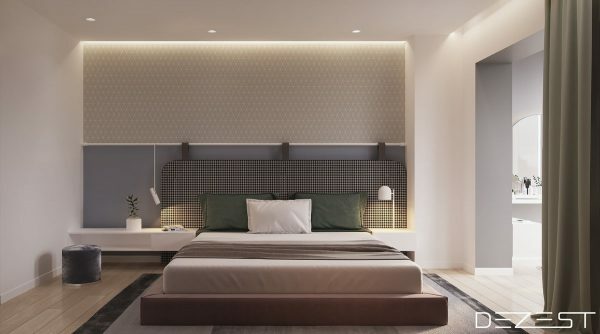 The master bedroom offers a more muted pastel palette. 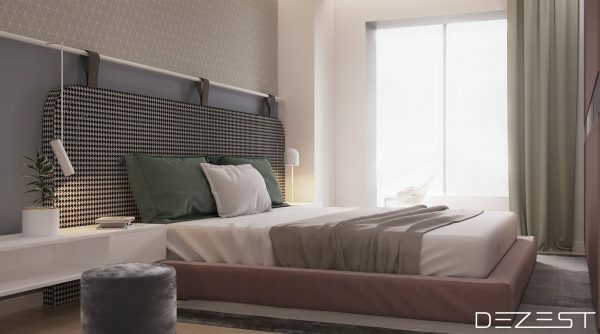 A chequered headboard sets the scene and reveals the bed, a medley of teal green, darker mauve and grey and white shades. LED lights add drama to a light beige wallpaper, while a long white bench stretches from end to end. A bedside table lamp and hanging pendant offer warmth. Looking from the side, more textures reveal themselves. A velvet ottoman in pastel blue shimmers grey, matching with an aluminium thread running through the feature wall. Mauve hugs the bed’s mattress, as the opposing wall wears it in strong, stitched panelling. Simple cotton sheeting ties in with the thick gingham headboard. Stepping to the side, an enclave in pastel blue awaits. 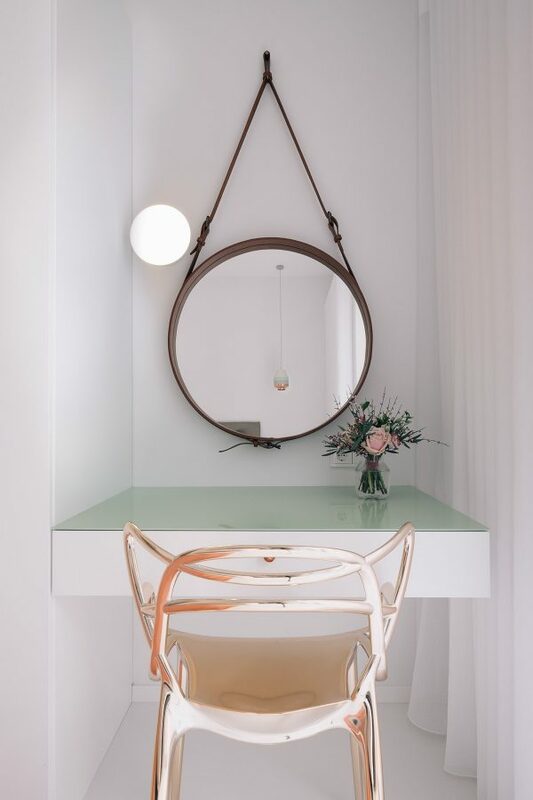 A nook of a powder room, decked out with a dressing chair in the Acapulco style, faces a circular mirror that just screams Scandinavian. 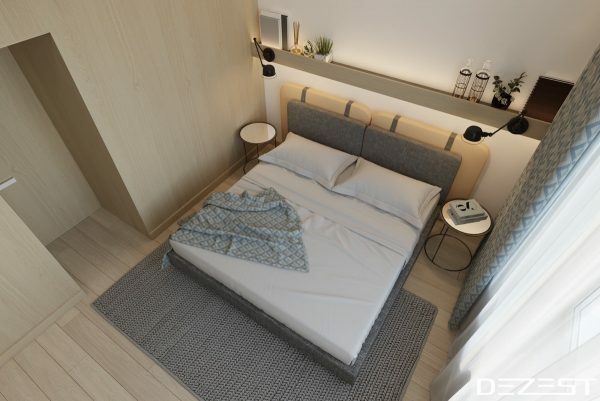 A simple white desktop mirrors the bedside benches, while a white cube beneath houses the essentials. A small display of cosmetics sits high beside what could double as a modern outdoor chair. Tying in to the bedroom’s headboard, a grey gingham couch nestles in another corner, beside a potted tree and floor reading lamp. A leaning long photograph pretends there’s stairs out the hallway. A stencil TV table harks back to the kitchen’s stools. Hidden behind the curtain, a spacious office lurks in the same pastel blue. A linen cubby chair provides a view to a Mac. 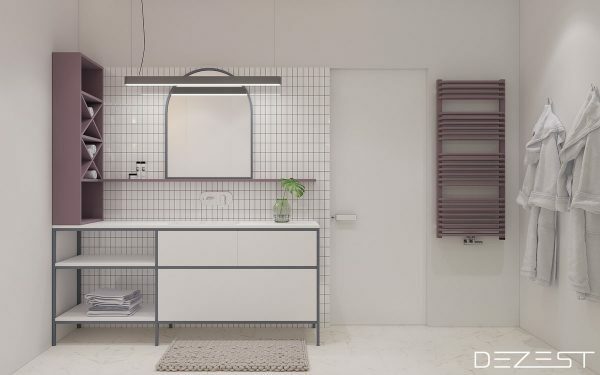 Using the same colour scheme, the master bathroom props up a range of shelving, mirrors and towel rails, some drenched in a darker shade of mauve. A cathedral-shaped mirror offers something different afront a tiled panel, while two bathrobes come hither. 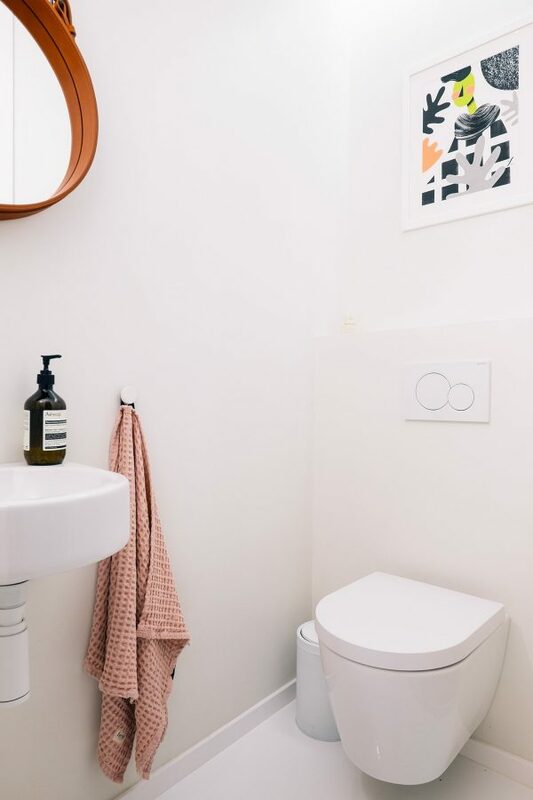 The other side of the bathroom boasts a similar mauve cabinet, with a toilet and bidet formed by small porcelain cubes. 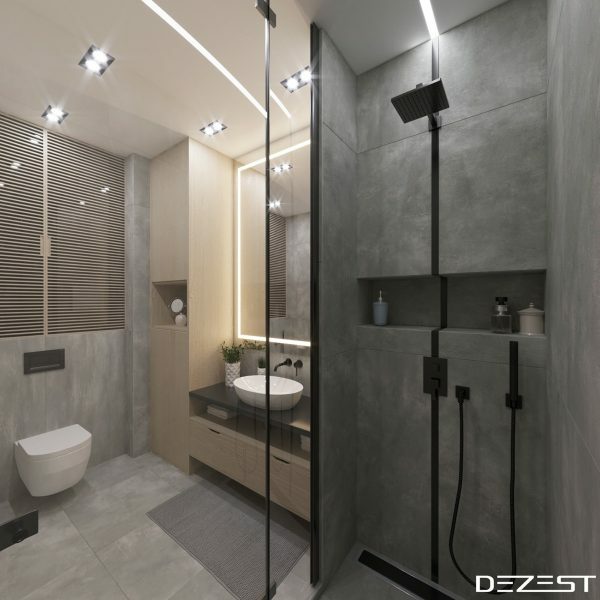 The shower blocks out a side in glass, while a modern wall sconce lights the space in two. 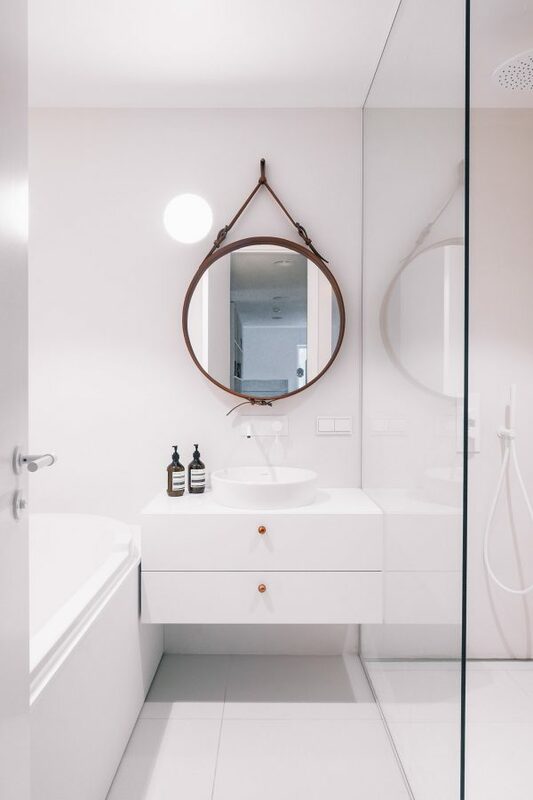 In the ensuite, a semi-circular mirror draws in the eye. Toiletry cabinets in teal mimic those in mauve in the master bathroom, colour-coding each space. A lozenge-shaped sink and stencil table take on a life of their own beside a single leaf. 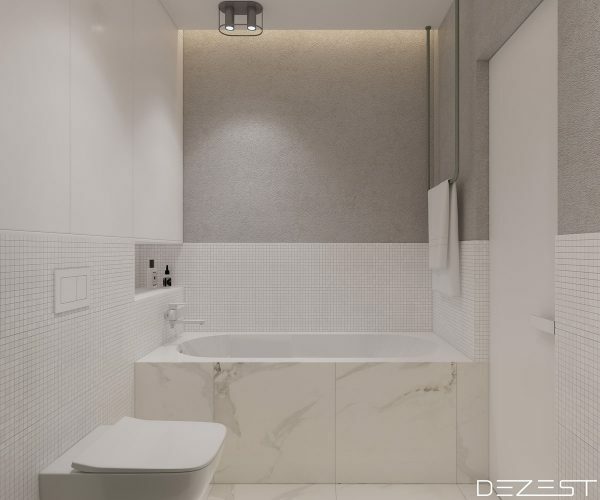 The apartment closes with a walled-in bath, similar in design to the master bathroom’s shower. Grey wallpapered uppers and an inset shelf keep the space modern. An industrial pipe acting as a towel rail adds punctuation. 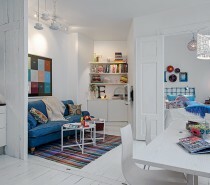 Our next apartment shows how temperature changes in colour can create a completely different mood. Opening up to the central lounge, this interior’s more traditional baby blue strikes us on tiled walls, while a cacophony of white and grey makes abstracts on the wall beside. 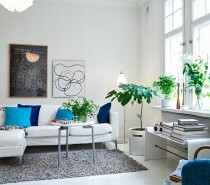 A more subtle teal covers the quilted couch and smaller coffee table, while white and wood lie low in the background. Three stripes of light face our gaze as we look towards the kitchen, a maze of blue and grey amidst large swathes of white cabinetry. A couple of butterfly lamps hang from the ceiling. Some monkey lights from Seletti add personality to the space, a bit of cheek beside the cityscape. Find cheaper versions on Amazon to save a pretty penny. The blues of the living space become more subtle in the bedroom, as they mingle between the bedsheets and wall. 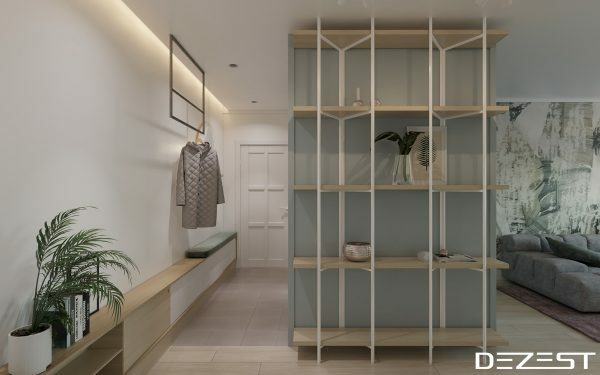 A Scandinavian clothing rack with built-in cabinet easily showcases clothes. 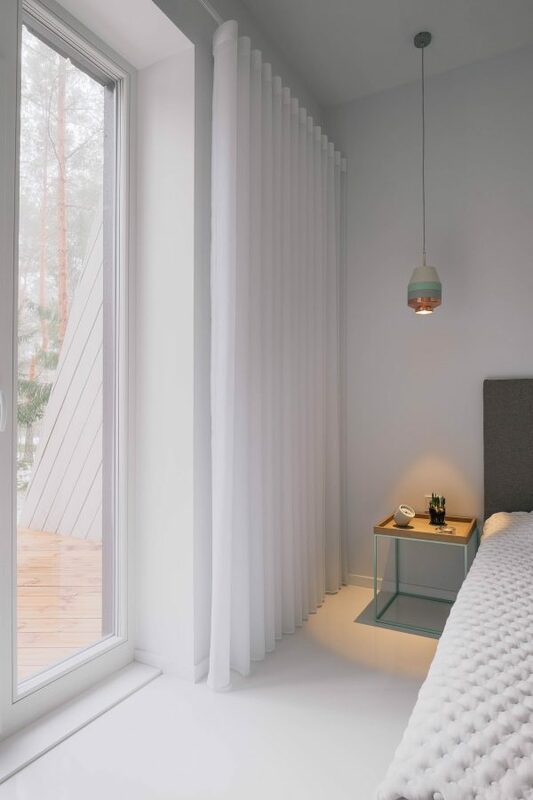 Bedroom pendant lights, an indoor house plant and petal-bottomed curtains add finishing touches. 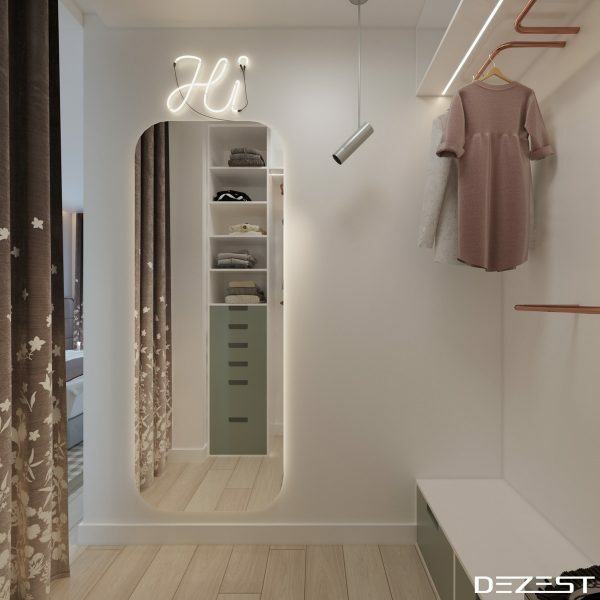 The walk-in wardrobe offers a lozenge-shaped mirror, greeting ‘Hi’ in stage lighting. 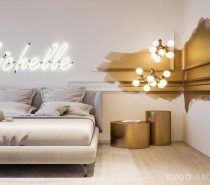 A simple line of LEDs and bronzed piping hang clothes. A simple white cabinet offers storage for slippers. 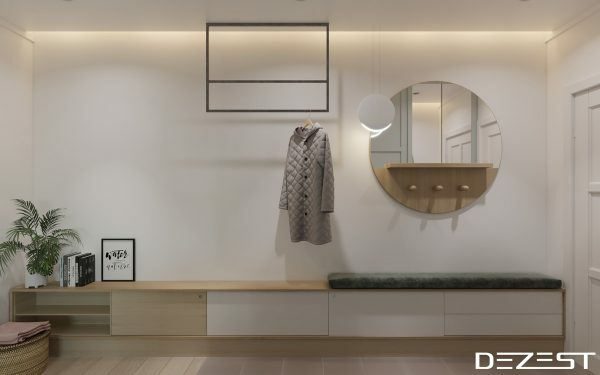 The entrance mirrors the tricks of the wardrobe, with a coat rack doubling as a geometric wall feature. A row of benching hides necessities and offers shoe storage. A circular mirror adds design, a potted fern flair. As we face the door, a baby blue, white and wood cabinet makes stencils out of framing. A few vases, prints and books serve as final reminders of this well-curated space. Our third and final space boasts bolder colours, using pastels as its background. The living room puts its best foot forward with a burgundy rug and green leaf abstract, accompanied by a navy dining chair. Unique wall clocks frame their digits on the wall, as a shifting bookcase relaxes the space in grey. 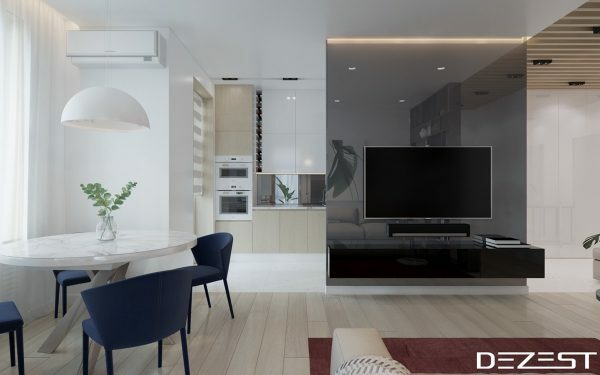 A mirrored cabinet and beige couch add less dominant decoration. From the couch, a white dome pendant catches the eye above a marble table and four navy chairs. A reflective acrylic panel makes the TV a feature. A sprig of green on the dining table adds additional life. The space’s little features make all the difference. A swing arm wall lamp lights the space beside the couch, illuminating conversation. Blocked and free wall shelves hold a variety of treasures. Intricate patterning in the marble dining table and lampshade inner introduce elegance. 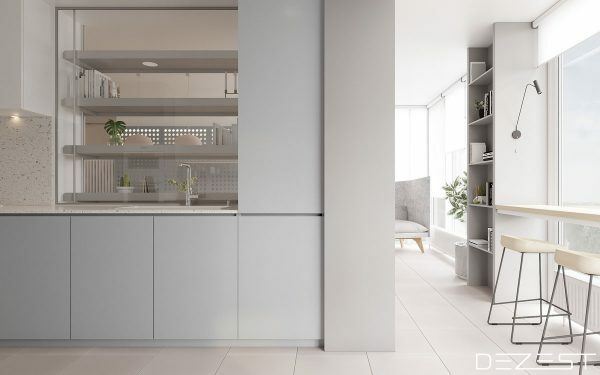 Through the sliding bookcase we lead into the kitchen, a grey and white dream with marbled benches and acrylic splashbacks. 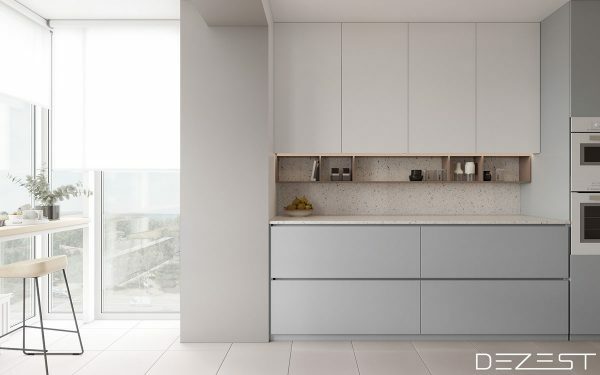 A line of subtle LEDs hide beneath the cabinets, making its clean white shine bright. 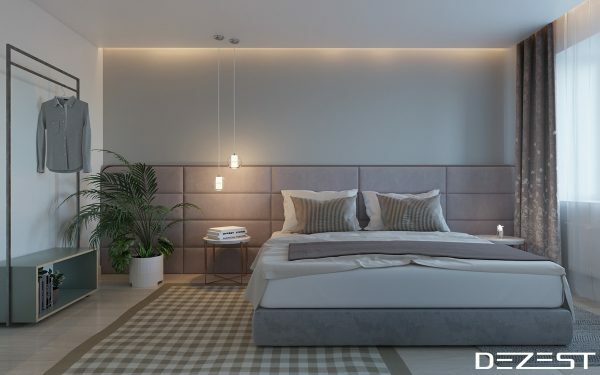 The bedroom reinforces grey and white, with a bed frame, cushions and sheets in the hue. Subtle hints of blue show in the rug; blue and green in the curtaining. Mini grasses chill on the shelves beside swing arm wall sconces. 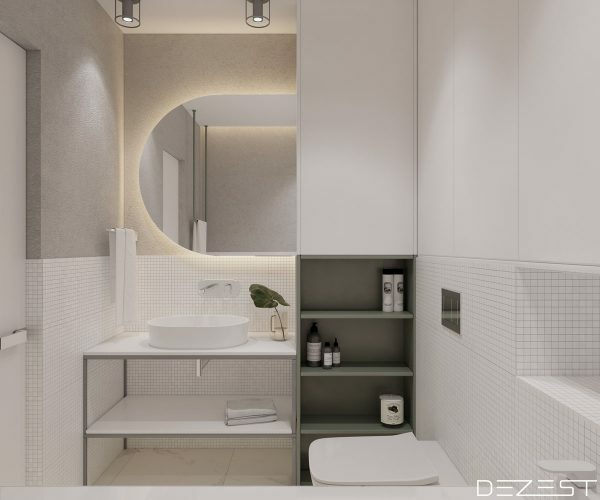 A foray into the bathroom shows more grey, white and wood, this time in slabs of stone and porcelain. 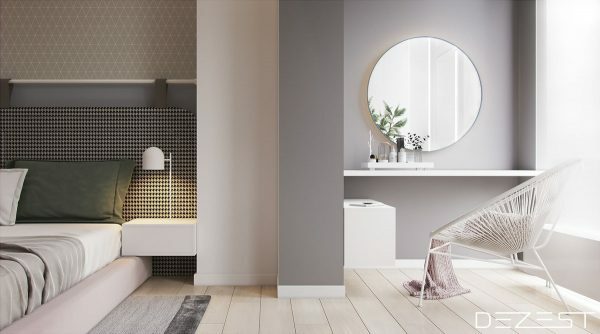 Circles steal the show in a mini mirror and standing basin, while a LED-lit rectangular mirror catches our focus. 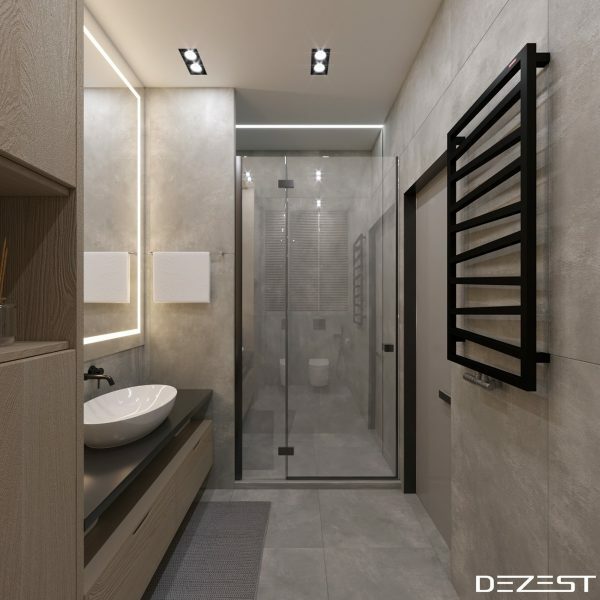 A view back from the shower reveals a thick black towel rail, a surprising feature in an ultra-modern bathroom. Darker grey lines around the shower help tie the bolder lines in. A built-in shampoo inlet shows off soaps, potions and conditioners, linking back to the inlet in the main space’s cabinet. Thick plumbing reminds of the towel rail. A pop to the rumpus room reintroduces more striking purples and blues, with a wall and floor in the same colour. A knitted ottoman, standing planters and an exposed brick wall add detail. The way out is paved in white and beige, a single fern leaf the last colourful relic. A wooden cubby shelf and countertop complement the wall treatment. Home staging can be tricky to wrap your head around. Most of time, it’s about taking your home as-is and making a few, small changes. Yet, somehow, those tiny changes can make a huge difference when it comes to attracting buyers. Sometimes it can even mean the difference between selling your home and having it sit on the market. If you’re about to put your home on the market, this post is for you. We reached out to professional home stagers and asked them to share their favorite tips for getting a home resale ready. Read them over and do your best to implement them in your own home. Once you’re done, we’re sure the impact will be well worth the effort. “Curb appeal is key. It’s the first impression your home gives, so make it welcoming! Invest in some inexpensive, flowering plants. (Boxwoods are great for the job.) If there’s room, you could add a couple of colorful Adirondack chairs to your front porch. 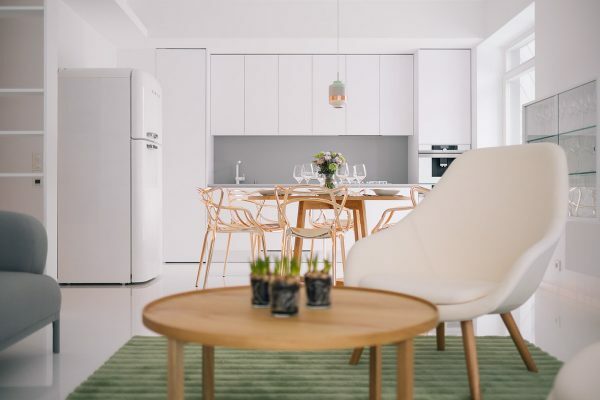 If your front door looks old or shows wear, a fresh coat of paint and some new house numbers can also make a big difference,” suggests Jeffrey Weldler, an interior decorating expert at Vänt Wall Panels. Remember that staging isn’t just for your interiors. When you go to sell your home, also make sure the outside looks its very best. While the front door is certainly important as the initial point of entry, be sure to apply Weldler’s advice to the rest of your exterior, as well. Cut and weed your lawn regularly, add plantings where appropriate, and put out a patio set if possible to help potential buyers envision easy outdoor entertaining. “I tell my clients to pack up their ‘territory markers’ as soon as possible. These are things like family photos, shoes by the front door, toiletries and refrigerator magnets. They tell you the story of the person who lives there. Instead, you want buyers to think, ‘I have no idea who lives here, but it needs to be me,’ ” says Justin M. Riordan, the founder of Spade and Archer Design Agency. The goal of staging your home is to appeal to as many buyers as possible. While depersonalization may be a hard pill to swallow it’s essential in helping your home be accessible to individuals with vastly different lifestyles and backgrounds than your own. That said, be sure to leave a few neutral accessories in place. They will keep your home from feeling stark. 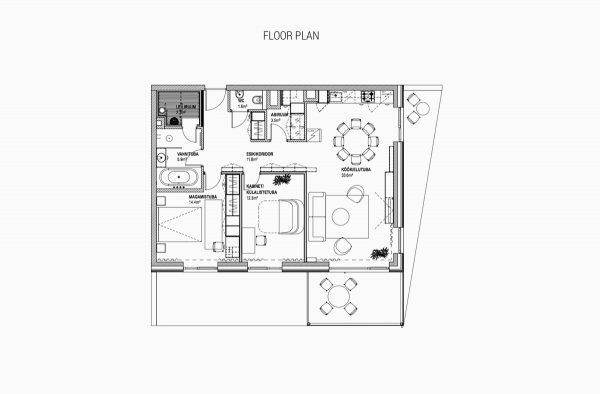 “Arrange rooms the way they’re supposed to be used. I’ve seen a formal dining room turned into a TV room, and that’s fine for some; it may be a turn-off for buyers who don’t intend to use the room in the same way,” advises Ana Cummings, the founder of ANA Interiors Ltd.
Furniture plays an important role in staging your home. 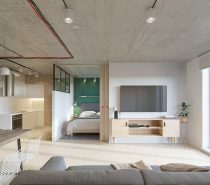 Not only will it give buyers a sense of how the room should be used, but it may also give them an idea of scale and help them envision themselves living in the space. It’s much harder to grasp these same concepts when a room is empty. Your goal as the seller should be to make the buyer’s showing experience as pleasant as possible, so do your best to provide them with a usable framework. Designate an area for kid’s belongings. Image: Aries Construction Co. Inc.
“If you have kids, keep a playroom. Keep it organized and make this the designated area for all toys. Before showings, do a loop around the house and move any runaway toys to their assigned space,” recommends Alison Bernstein, the founder and president of Suburban Jungle Realty. This tip is also about depersonalization. Everyone understands that moving with kids is difficult, but parents and non-parents alike are more likely to respond well to your home if all your kid stuff is contained in one designated area. It will also be much easier to clean up for showings if you know that all the toys should be brought to the same place. In the same vein, pet owners may want to consider following a similar principle with their animals’ accessories. “Have a neutral third party take a critical eye to your home. Living somewhere daily reduces your ability to notice the things that might be a problem for buyers. 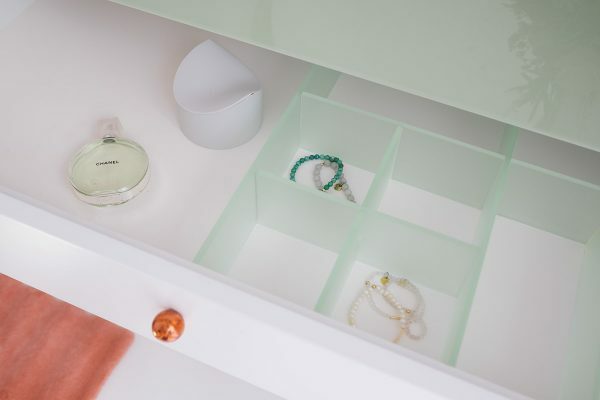 Dirty walls, scuffs, scrapes, leaks, or even odors might be present, but odds are, you have become accustomed to them over time,” says Marty Basher, home organization expert for Modular Closets. Hearing less-than-steller reviews of your home can be hard, but remember that it’s for a good cause. If you decide to follow this tip, choose someone you know has your best interest at heart. Then, the hard part: Actually follow their advice. When all is said and done, you’ll be glad you did. Staging your home is an important part of getting it ready for the real estate market. Even if you don’t have enough money to reach out to the pros, we’ve got you covered. We asked real home stagers to share the best tips for getting a home resale ready. Give them a try and you should be pleasantly surprised at the results. Did you stage your home before resale? Did you hire a pro or go the DIY route? Share your experience with us in the comments. 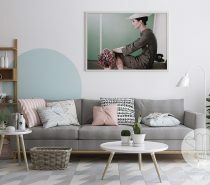 The post Home Stagers Tell Us Their Best Tricks for Making a Home Resale Ready appeared first on Freshome.com.